Ryanair is an Irish airline based in Dublin and founded in 1985. It is Europe's largest low-cost carrier and one of the world's largest airlines. In May 2007 Ryanair launched the world's first free seat giveaway, offering 1 million passengers the chance to get free flights. Also in May of that year, Ryanair launched its price guarantee that no other airline can match their fares. In 2009, Ryanair announced they would be closing all check-in desks and passengers would have to check-in online. Luggage is deposited at a bag drop. In May 2013, Chief Executive Michael O'Leary announced plans to target European-USA flights. Why are their flights so cheap? Ryanair Flights - Where do they go? Ryanair currently operates 1,600 routes across 29 countries from 57 bases. Ryanair’s Dublin to London Stansted route is its largest route in terms of passenger volume. Ryanair flights are offered on short-haul routes to secondary and regional airports in and around major cities and holiday destinations. Ryanair favours secondary airports as a pose to major airports as they are generally less congested and, as a result, can provide higher rates of ontime departures, faster turnaround times, fewer terminal delays and more competitive airport access and handling costs. 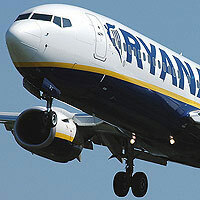 In 2013, Ryanair is expected to carry over 81.5m passengers, with more international passengers than any other airline. It operates to and from 180 airports. The Ryanair fleet consists of 303 Boeing 737-800 which can carry up to 189 passengers. In 2004 approximately 60 new low-cost airlines were formed. Ryanair's main low-cost competitors have included easyJet, Monarch Airlines, bmibaby,Centralwings, Air Berlin, Germanwings, Transavia, Jet2, SkyEurope, Vueling, Wizz Air, Flybe, Thomsonfly and TUIfly. Ryanair is often praised by some and criticised by others. Its supporters praise its commitment to low fares and radical management, whilst its critics point to its controversial advertising strategy and the way it deals with competing airlines. In August 2007 the UK's Advertising Standards Authority upheld a complaint that Ryanair was misleading the public with an advert that compared its service from London Stansted to Brussels with that of Eurostar. The advert claimed Ryanair was quicker and cheaper but the ASA ruled that Ryanair had not included the time and costs of travel to and from the airports in question within its comparison.